This is one of my favorite Tang poems from the great master Li Bai. Li Bai is awakened suddenly and sees a light. He is confused at first about what it is and then notices the moon. It seems he thought for a moment that he was home and then realized he wasn’t. This brought out in him a sense of longing for home. This kind of thing happened to my twice recently. Two nights ago we had the opportunity to go on a home stay with students and their families from the middle school (like our high school) associated with Beijing Normal Unoversity. This is one of the top middle schools in Beijing and the students are extremely gifted and fairly fluent in English. The school has a beautiful city campus with excellent facilities that would be envied in the US. I was graciously hosted by the family of Zhang Zeyu. The brought to the nice apartment in the outskirts of Beijing and we had the opportunity to talk about many things in China and the US. What struck me was that people to people contact brings out the best in us. The Zhangs were wonderful hosts and welcomed me into their home and went out of their way to make me feel comfortable. 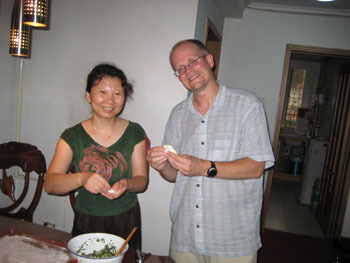 Mrs. Zhang even taught me to make dumplings (see below). Mine didn’t turn out so well. The food was fantastic though, probably the best I’ve had in China! That night, lying in bed, I woke suddenly and didn’t know where I was. For a split second, I thought I was home and then remembered where I was. Perhaps a taste of home life brought out a little homesickness as I thought about my own family. I am having fun here but I do miss them!